Jill wanted some ideas for make and takes at the retreat and I had seen the paint fusion stamps and paints and really fancied having a go. I bought the things back from a crop and watched the DVD - which, incidentally, says the the poppies are "more advanced class" - typical me! These are the results of my first attempts. I was quite pleased with the results but felt the stark white background was too harsh. I thought of trying the crackle backgrounds etc on the DVD but didn't really have the time to further that idea. I then saw on Create and Craft some mountboard shapes by Sheena Douglas which look really nice - hearts and tags so I ordered them. This set me thinking and I came up with the plan for the retreat - make bookmark sized rectangles on mountboard. Lynn got an A1 sheet at Hobbycraft for me which Robert then cut to size. I spent Sunday morning stamping them as below. As the mountboard is creamy colour it gives a better background. 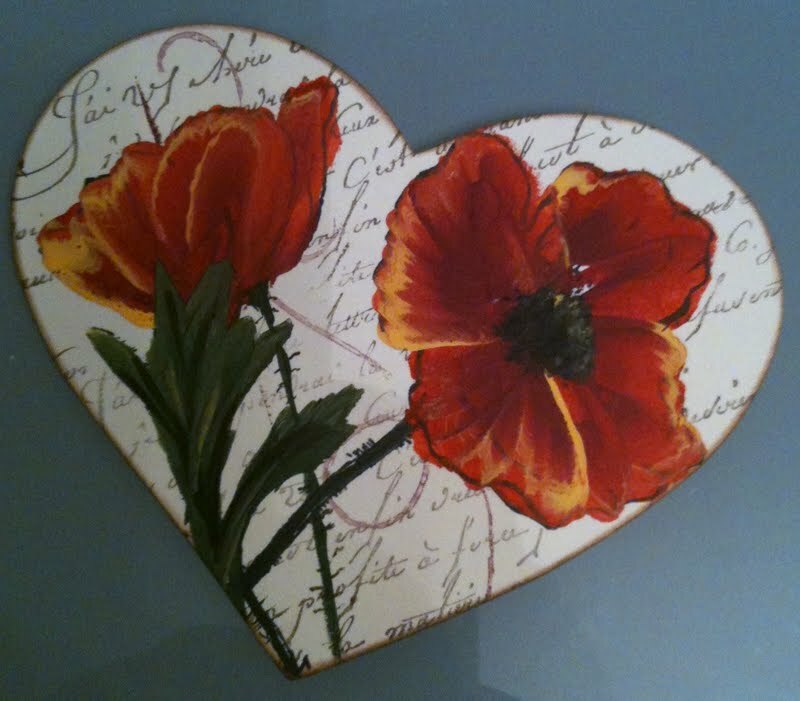 I painted in the poppies and leaves and allowed to dry. The edges were inked with a brown chalk pad then I made a couple of masks with post-it notes for the flower heads. Once dry, I added the masks then stamped over the background with "early espresso" ink pad from Stampin' Up and an old text stamp I had. I blotted the stamp first to give a lighter image. I then added a couple of swirls with "rich razzleberry" by SU also blotted first. This is one of the heart shapes I made in the same way. Stamps, Paints, Brushes and DVD all available from Cardinal Colours along with other exciting products. I now have some Christmas stamps so will be making more soon (I hope!). Thanks to Jill for organising yet another fabulous retreat - if you went along, I hope you enjoyed it too. These are absolutely beautiful Linda.....they look like you have been painting for a long time, really gorgeous! These look lovely, always useful to learn something new. I love the way you adapted the original idea with the text stamp.